While Darksiders 3 may not feature one large open-world, it still has plenty of connected sectors you’ll need to hop between during your hunt for the Seven Deadly Sins. Often you’ll find yourself needing to backtrack to a previously visited region, so it’s well worth learning how to fast travel to save yourself more than a few arduous journeys. In this guide we’ll teach you how to use the fast travel feature in Darksiders 3 to save a good chunk of time. Darksiders 3 will ask you to revisit old areas fairly frequently, and you’ll also want to head back to blacksmith Ulthane regularly to spend souls on levelling up and upgrading your weapons and enhancements. Fast travelling is therefore a very important skill to learn, and thankfully the process is extremely simple. 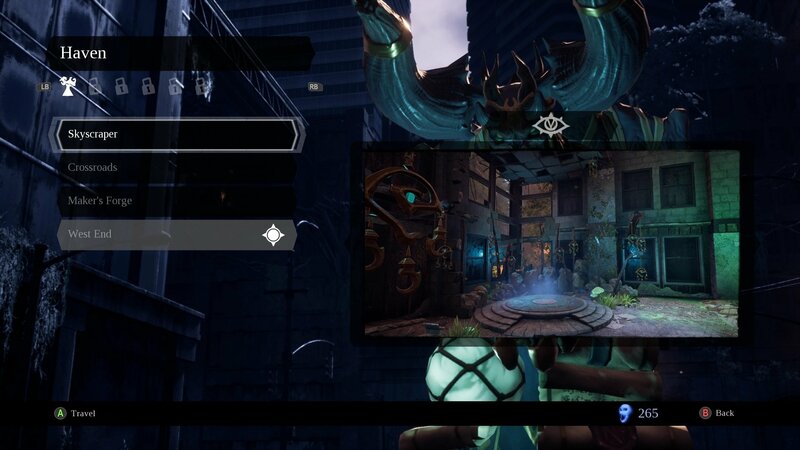 To fast travel in Darksiders 3 all you need to do is find and speak with Vulgrim. He’ll give you access to Serpent Holes, a vast network of tunnels which link the world together. Speak to Vulgrim and select the Serpent Holes option and you’ll be given a list of locations to fast travel to. You can scroll through these with L1 and R1 / LB and RB to select the one you want. You’ll encounter Vulgrim in each area of the map, so make sure you remember his location in case you need to fast travel or access the shop in future. You can recognize the routes to his locations by the charms hanging nearby. Each time you find a Vulgrim Plinth it’ll be added to your list of fast travel points and even serve as a respawn location, so be sure to explore if you see a charm nearby. With fast travel mastered you’ll have no problems returning to Ulthane at the Makers Tree whenever needed. While you’re here you may want to learn some other tricks to help you out in Darksiders 3. Here’s our guide on how to swap between Hollow Forms, while over here you can learn the full voice cast for the game.